New for 2018, Team Neutrino’s custom developed ScoutMaster system. A programmable, reusable scouting solution! For 2018 the ScoutMasters are able to keep running averages of a team’s cycle times to the scale, exchange, switch, and opponent’s switch as well as tallying how many power cubes were delivered to each. Each scout will operate a ScoutMaster throughout the teleop period of the match. At the conclusion of the match, the scout records the numbers displayed on the 16×2 character LCD on a scouting card. 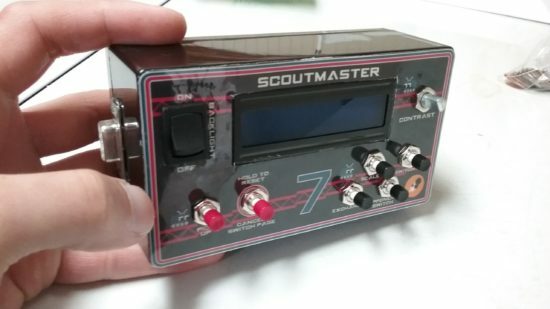 The ScoutMaster device comes built in with 6 pushbuttons and a 16×2 character LCD. This allows for reusability year to year. It is programed through a 9 pin d-sub connector on the left side and is powered by micro USB on the right side. A switch on the front operates the LCD’s backlight and a contrast knob on the front controls the lcd’s contrast.